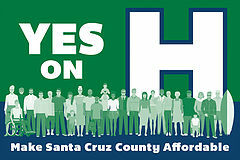 The affordable housing crisis affects all of us in Santa Cruz County. Here at the Housing Authority, we provide housing and rental assistance to thousands of low-income families who might otherwise be priced out of our local rental market or even face homelessness. Still, the need for affordable housing is far greater than the number of affordable units or assistance available. The development of affordable housing is directly aligned with the Housing Authority’s mission, and will help the Housing Authority fulfill our goal to help all Section 8 voucher holders find a rental unit and to expand the number of units with project based voucher assistance. Therefore, the Housing Authority Board of Commissioners joins Affordable Housing Santa Cruz County in endorsing Measure H.